In this series I’m documenting the remodeling of my 2003 Dodge Ram 1500 Conversion Van from a family travel model to an RV. 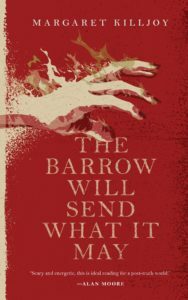 Work was done in the spring of 2014 and written about 6 months later, so my memory is fuzzy. Starting from right behind the driver’s compartment, I ripped out almost everything from my van, down to the bare steel floors and walls. The exceptions were the foam on the floor, the rear air-conditioning, and two of the rear speakers. For the most part, this just required a screwdriver and brute strength. Neither of which I started the project well-equipped with, and being me I just started with an eyeglass screwdriver. After a very frustrating day, I moved up to a regular ratcheting screwdriver. Then I got a cordless drill and my life finally started to make sense. The goggles were good and I wore them all the time. 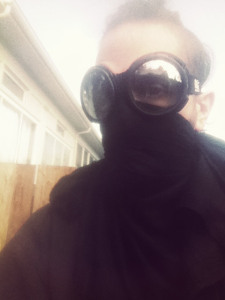 The bandanna mask was soon replaced with a respirator. Removing the rear seatbelt anchor bolts from the walls involved a torque wrench and a t55 bit. It was only a couple of dollars, which is good because that’s all I’ll ever use that bit for. Removing the wiring was tricky and nervewracking. I pulled an entire trashbag’s worth of wiring out of the back, carefully leaving everything that was attached to the ground post on the floor and wrapping any loose ends with electrical tape. 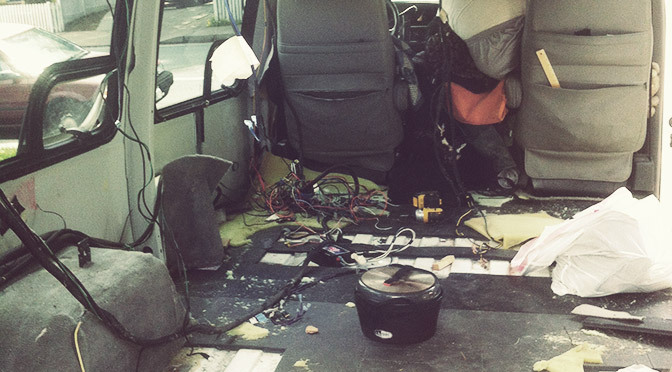 Much of the wiring was covered in fiberglass insulation. the old ceiling. Note the two silver air ducts, which I carefully pried free. The insulation had been spray-glued to the walls and ceiling in places, and I put on gloves and rubbed it into little balls and went over it all with a shopvac a million times. I ended up leaving the carpet on the rear wheel wells after realizing how impossible it was to get off, and on the gas-tank-intake protector on the driver’s side wall for the same reason. When I took out the ceiling, I did so careful not to destroy the two insulated air ducts that were glued to it. I saved almost everything as I went, but in the end the only stuff I re-used were two of the speakers (with their speaker cage protector thingies), a number of screws, and the air ducts. The next thing I did was the underlayment, which is to say, the under-floor. I might have overkilled this part, it’s hard to say. What I did has worked thus far though. I left the black foam and then screwed down 3/4″ (I think) plywood that I cut to fit. On top of this I put down QuietWalk underlayment, which serves as a vapor barrier and minor soundproofing between the plywood and my laminate hardwood floor. Probably, I could have stopped with just the plywood and been fine. But I wanted a fancy van, dammit. 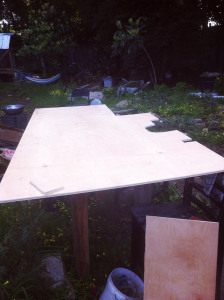 The main piece of plywood for the underlayment floor. For cutting the plywood to fit, I probably should have done what the internet told me: cut a stencil from cardboard. But being me, I didn’t, because that seemed complicated. So I just measured, kind of obsessively. I had to cut out shapes for the wheel well, the fuel tank intake, and the electrical ground post. I did it by setting the plywood on the floor of the van and using my carpenter’s square. It worked fine. I cut the shapes with a sawsall, because I hadn’t gotten a jigsaw yet. A jigsaw would have been better. The first floor panel in place. The other two pieces were easier. 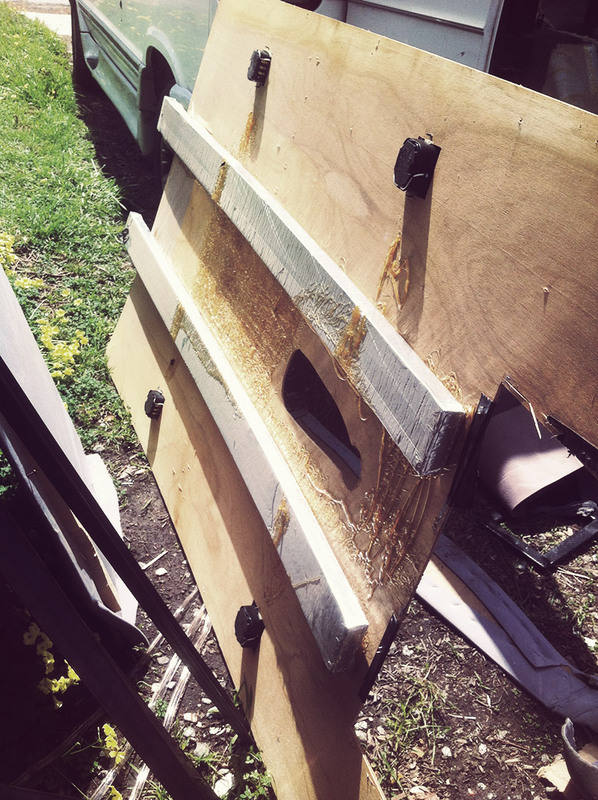 The starboard panel got one cut for the wheelwell and another for the step up into the van. Note that this photo of the all the panels in place is misleading: after I put it the last piece down, I realized I was covering the access to the spare tire, so I had to cut a chunk out of the biggest panel. 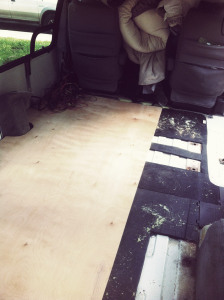 Securing the plywood was actually the only part of the whole van remodeling that required (direct) help from someone else. 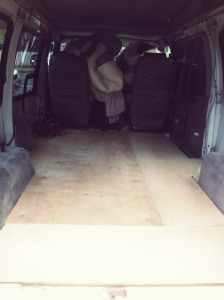 I used screws that went in through under the steel floor of the van up into the plywood (intentionally using screws that wouldn’t go all the way through the wood). I had to have someone stand on the wood in order to weigh it down. I thought about leaving this part of the floor “floating” but decided that with a van, it would shake and rattle and maybe pop up or shift, so I screwed it down. 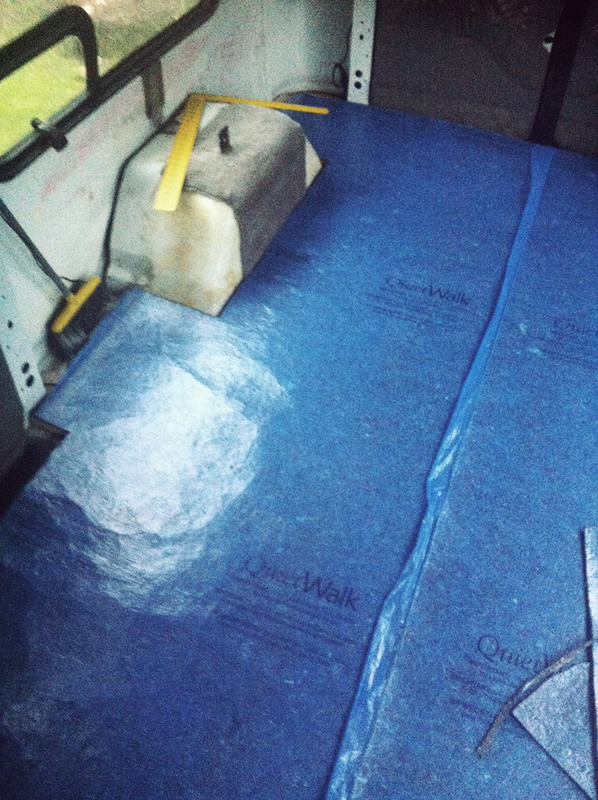 The QuietWalk underlayment came next. This part was easier. It comes in a big roll, and I rolled out a length, figured out where to cut it the same way I figured out the plywood cuts, and taped it down into place. It has a built-in adhesive on one edge, where you tape it down to its neighboring panel. 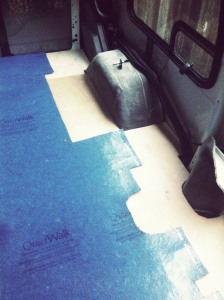 The QuietWalk Underlayment in place. My underlayment was done. Because I decided the walls would go into place before the floor (so that the floor butted up against the wall, not the other way around), I had to walk on the underlayment for the next many weeks. And I was living in my van at the time, too. (I kept my futon mattress folded up in the front seat during the day). So I made sure to stay barefoot in the van. And when I ripped the QuietWalk by accident (which I did numerous times, usually with the carpenter’s square), I circled the holes with a sharpie and then later went back over them with clear sealing tape. Do you have pic of framing and insulating? Rest of your build?